The Free Burma Cafe has unfortunately closed for business, but Free Burma Cafe Catering is still available, so if you are hanging out for that unique FBC taste, why not book us in for your next function! The Free Burma Cafe is a social enterprise designed to help newly settled Burmese refugees in the Springvale area. 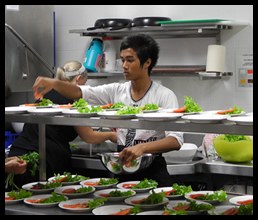 The aims of the cafe are to address the issues of training, employment and belonging amongst the Burmese community. The Catering arm of the Free Burma Cafe was actually developed before the cafe began as a way to raise funds for the cafe project, but received so much support we have decided to keep it running. In the early days, the cafe ran “Dinner Parties with a Difference” which included a great meal, a talk about the troubles in Burma, the journey of a Burmese refugee to finally settle in Australia, as well as about the vision of the cafe. We also asked for people to support the cafe with donations. We were able to raise approximately 80% of our funds for the cafe through this initiative, which is something we are very proud of!! We no longer run the “Dinner Parties with a Difference” but we are still keen to share about Burmese and refugee issues. If you are interested, we can organise a speaker for you on this topic. We have spoken for many different groups including running whole classes at school for both primary and secondary school students. But we don’t have to speak at your event. If you just want us to cater for you, then we do that too... we have catered for a variety of functions, from conferences & seminars to weddings & birthday parties. We have even catered a 3 course meal for over 450 people!! And the best bit is if you use Free Burma Cafe Catering for your event, not only are you getting a unique catering experience, you are also supporting the settlement of refugees in Melbourne.